Lowell started Traction to pursue his passion: helping fellow entrepreneurs scale and sell software companies. As a founder and CEO who has extensive acquisition experience, Lowell navigated the gap in the $5M-$50M merger and acquisition market. Traction was built to help others do the same. Lowell twice built the leader in the online market research data collection industry for GMI (sold to WPP for $100M) and Toluna (sold to a Private Equity firm for $260M). He co-founded FlexMinder - (Healthcare IT - sold to JellyVision), in addition he led the buying side of many transactions including a $10M technology company in Texas and a $40M technology company in Connecticut. At F500 Rockwell Automation as a Global Sales VP he worked closely with Corporate Development on acquisition strategy. Passionate about helping others, Lowell is a mentor with Startup Weekend, Nomadic Mentors, Techstars, University of Washington CoMotion and dozens of early-stage companies. Lowell was developing code by age 15. He is a graduate of the University of Wisconsin in Electrical and Computer Engineering. Outside of work he spends time with his family, skis, plays tennis and travels the world. Matt is a Chicago native who has always had an interest in entrepreneurship. Prior to Traction, he helped grow an advertising agency from 23 to 150 employees. During that time as an account manager, he honed the art of taking complex ideas and distilling them down to clear, concise messages for companies such as Kimberly Clark, ConAgra and Red Box. That ability carried him far at the University of Washington during his MBA where he rounded out his business acumen. While there, he entered the business plan competition where his team earned best consumer product. He also wanted to gain exposure to the funding side of startups, so entered the Venture Capital Investment Competition where his team placed 2nd in the world. After graduating, Matt joined PwC where he spends his time building and scaling sales teams for technology companies. In his spare time, Matt can be found on a mountain, catching live music or supporting Chicago sports. Based in London, Dietmar is an entrepreneurial Chairman, CEO, Non Executive Director and Business Advisor with a track record in setting up, growing and leading global tech, data analytics, software and market intelligence organisations, from start-up through to successful exit. Most recently Dietmar architected the merger of 2 international tech companies MARSC (UK) and MI Pro (Norway), becoming Chairman of the merging entity QuenchTec. Previously he held senior positions within the tech and data analytics industry as CEO of big data analytics company Commetric, VPInternational of online market research company GMI as well as global roles at IT research and consulting groups Gartner and Maritz. Dietmar is fluent in English, German and Italian. Studied economics in Trento (Italy) and Augsburg (Germany) and holds an Executive MBA from Oxford Brookes University awarded with distinction. Natalie graduated from the University of Michigan with a degree in International Studies focusing in Political Economy and Development. Also with a strong background in digital marketing and web design, she is passionate about politics, traveling, and learning about how to use the digital world and marketing to tell creative stories in any industry. Natalie is a Project Coordinator at DCG ONE in Seattle on the creative digital agency team. She oversees the logistics, customer experience, and delivery of digital projects that incorporate a broad range of UX/UI and creative capabilities from user testing to full website builds for clients that extend from the financial industry to sports teams. 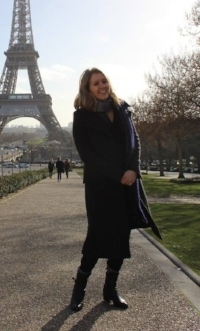 After living and studying abroad in Paris, France for a combined three and half years, she developed a passion for exploring and understanding international relations and cultures and is fluent in French. In her spare time, she can be found spending time with family, skiing or planning her next trip around the world. Jodie Buntain-Ricklefs got her undergraduate degree at the University of Michigan and two masters degrees from the University of Washington. She has served in a variety of consulting roles and has worked with a broad range of organizations for business development. Jodie coordinates research at the University of Washington.